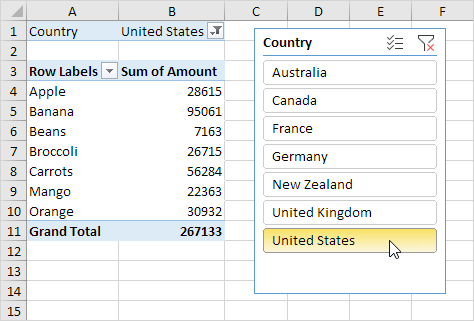 You can insert slicers in Excel to quickly and easily filter pivot tables. However, using the report filter gives the exact same result. To insert a slicer, execute the following steps. 2. On the Analyze tab, in the Filter group, click Insert Slicer. 3. Check Category and click OK.
4. For example, click Fruit to only show the fruit exported to each country. Note: the report filter (cell B1) changes to Fruit. Hold down CTRL to include fruit and vegetables.